I wouldn’t consider myself an environmentalist or as tree-hugging as many of my Millennial peers but I would consider myself a minimalist. For those looking to declutter in an increasingly cluttered world, paper has got to go. I am a recovering paper hoarder. I used to methodically and religiously file every contract, handout, bill, and insignificant note only to find that I never revisited the darn things. The filing cabinet never made it easy to search and access the relevant info I needed in the moment. Today’s digital age has changed all that…thank goodness. 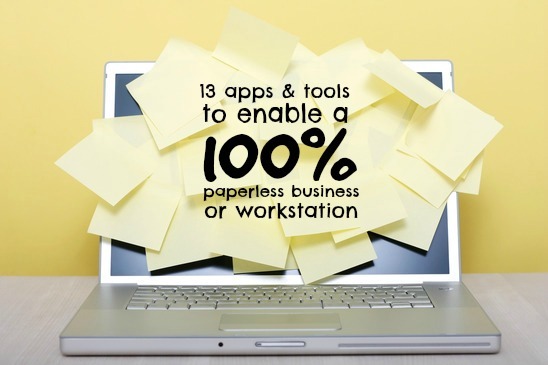 Here are the apps and tools I’ve leveraged to achieve a 100% paperless business. An app that turns your phone into a portable scanner making paper or images into PDFs to be shared via email, Dropbox, Evernote, etc. TinyScan has replaced my scanner. For documents I have to sign: I print, sign, snap, send, save, then shred. An app that turns your phone into a fax machine for documents, photos, receipts, and more. For the rare cases that someone requests a fax, TinyFax pares well with TinyScan to send the document via a fax number. A closed source freemium suite of software and services, designed for note taking and archiving. I leverage Evernote to bring all of my work, notes, ideas, and writings in one digital workspace. This tool has turned my laptop, tablet, and phone into the only notepad I’ll ever need. A web and mobile task management application designed to enable teamwork without email. I use Asana to capture all of my to-dos and project tasks. Asana has replaced all of my physical “to-do” lists and scattered post-it notes. A free time-management web and mobile application by Google. I used to have a physical day planner but booking appointments on the fly became to cumbersome. A 100% transition to Google Calendar took me awhile but was well worth it. A web and mobile email service by Google. As burdensome as email is becoming, it still remains as the gateway key to much of the Internet. I leverage Gmail as a catch-all for the paperless statements (bank, bills, etc.). iBooks is a simple way to download and read books on a tablet, laptop, or smartphone. If I can’t find the book I want in iBooks, I can usually find it on Amazon with the Kindle App. Utilizing these apps for reading is supremely helpful since the text and my notes are searchable, making any information easily retrievable. A single-coat, roller-applied whiteboard paint that transforms almost anything into a high-performance dry erase surface. The IdeaPaint that covers my office walls enables the brainstorming that a traditional pad of paper used to allow me. A free cloud service that lets you bring your photos, docs, and videos anywhere and share them easily. Thanks to Dropbox there is no need for me to print extra or back-up copies since I can upload and access them from any connected device. An app that provides important day-of-travel information for Delta passengers. Goodbye paper boarding passes and hello to an effortless and paperless check-in and boarding process with Fly Delta. I use the default Apple notes app as my digital post-it note. I record travel miles, gym goals, grocery lists, and refer to it for an on-stage story I share with my audiences. I actively revisit this app to delete irrelevant notes in order to keep it succinct and clutter free. You can achieve paperless, but you can’t stop some entities from sending you paper. In those cases, turn the paper into a digital copy and shred the physical. I use the Homedics ID Defender. I have hard copies (and digital) of my speaker introduction that’s read before my presentations because many of my clients prefer reading from a paper copy. I’m currently experimenting whether or not the light from a tablet affects my sleep so I have switched to reading physical, non-business related books before bed. I read magazines while I travel. It just feels right. Question: How have you achieved less paper use in business?